Thread: ID: Stiphodon sp.. but which one? I just picked up this fella from one of the snail tanks at C328. Very beautiful fella but its very shy. I know its a Stiphodon species, but which one? I thought it might be S. percnopterygonius, dark-blue form. Close-up of the head, a little blur but you can make out the blue specks on the face. During the holding period in a small plastic container, I lifted it up and at a certain angle I can see clearly the neon blue cheeks and a slim neon blue line running from the cheeks to the base of the caudal fin. Any leads or tentative IDs would be much appreciated. Didn't know yours were from C328, are they still alive in your care? Because I could never get them to stay alive for long. The one that I just bought is a very small fella. Helen a bit busy lately, so she says. are these very different from those regular neon gobies? looks sama sama on the pix. 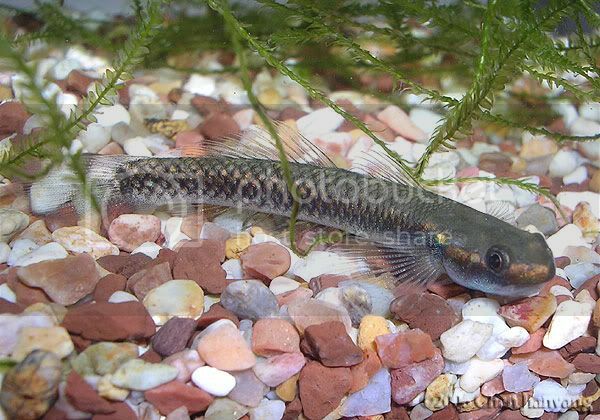 I heard the common name is blue goby, it's an algae eater. Choy, its slightly different from the blue neon goby S. atropurpureus. 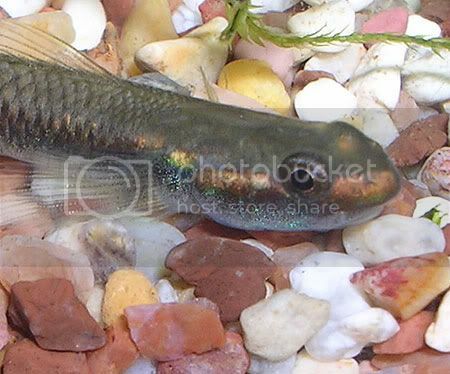 This fella adopts a dark colouration with criss-cross net pattern on the body along the edges of the scales when kept in a tank that has a dark substrate. My tank has ADA Amazonia and he turns dark grey in there but retains the shiny blue specks along the head region. Should be a male since females usually do not have colours except for 2 longitudinal lines running the length of the body. Today the fella's neon stripe just got more intense and the body is almost black. Nice fella.. glad I bought it.